Our friends at LetsGoDigital.org have made available a comprehensive underwater housing review which should be of interest to our Nikon D300 owners with scuba diving interests. The review of the Subal ND30 is packed with product images supporting a friendly and informative write-up delivered by Karin Brussaard. Even if you don't plan on taking your precious D300 underwater, this review is interesting reading because the massive supply of supporting images serve as an insight into the world of underwater photography. 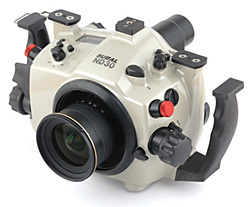 The Subal ND30 is an underwater housing for the Nikon D300 primarily composed of aluminum. It is rated to run your D300 down to 70 meters (210 feet). "The combination of the Nikon D300 digital SLR camera and the Subal ND30 underwater housing is a dream pair. The Nikon D300 camera is super fast, has many setting possibilities and the 3D auto focus is superb. 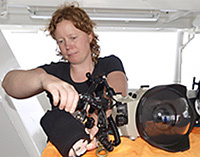 The Subal underwater housing is of extremely high quality, neatly finished with a good hand-fit." But, don't just rely on a snippet of her comments-- check out the entire review. The veil finally slipped this week as several UK subscribers to this month's Nikon Pro magazine found an article about the long-speculated replacement to Nikon's FX full-frame camera and alerted us about it. Seb Rogers, cycling sport photographer, gives details on his blog page and includes scans of the article in question. So the question remains, what will the market response be to the newest arrival? Surprisingly, some of the vital stats remain quite conservative; the difference between the ground-breaking D3 really appears to be the boosted MP count. Of course, with the gorgeous image quality and the higher ISO, most shooters will welcome the larger reproduction potential. Action shooters may be let down by the relatively humble 5fps (FX) and 7fps (DX) shooting rates. And similar offerings from Canon and Sony have been on the market for a while now. Nonetheless, it's looking to be a very pleasant holiday season for NIkon shooters who have been holding out for this evolutionary model. In case you have missed it, DxO (French specialist of noise reduction software, also advertising their products on Nikonians) came out with a new raw format benchmark (dubbed "DxO Mark") some days ago. What they do is actually not really measuring the performance of the sensor, but rather of the raw format the camera produce - which is probably the single best option you have if you are not going to ignore the firmware sitting behind the sensor. There database, albeit not really too comfortable to navigate IMO and several links are hidden pretty well, allows you to compare various brands side by side as well as to see the top ranked cameras listed. The list is lead by Nikon D3 followed by the Nikon D700. Third position is held by Canon 1Ds Mark III. This is due to change very soon since new cameras are just right around the corner. The DxO team has collected and answered some of the questions that were raised after the first week of beta running their site and state they will continue with an open dialog with the photographers. I think this benchmark moves us in the right direction, allowing for more transparency, making various manufacturers more comparable by objective means. Brought to you by Roberts Imaging, authorized Nikon Professional Dealer. For the MP3 version of this podcast (audio only) click here (16.5MB). 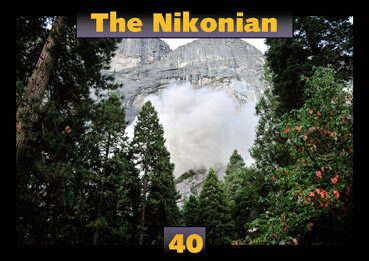 Our latest edition of the official Nikonians community magazine, eZine #40, features reports from the 8th Annual Photo Adventure Trip Yosemite rockslide witnesses and the wrap-up on our Nikonians Team activities at Photokina 2008, in Cologne, Germany. You can click here for the free download which will come as an almost 4Mb PDF file. 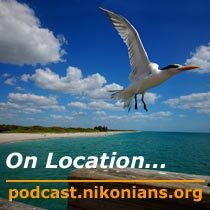 Look for a deadline sensitive reminder (November 30) of the Thanksgiving Special being offered through our Nikonians Photo Pro Shop. The eZine highlights include reviews of Nik Software's Silver Efex Pro and Think Tank Photo's Airport Airstream international carry-on roller. -- as well as a sneak peek at the start of the 2009 calendar for the Nikonians Academy. The Nikonians Business Directory, launched in September, has become a popular visitor site since becoming established as the official Nikonians directory service. 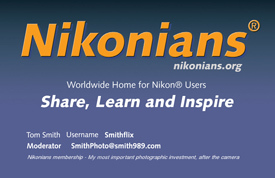 Also known as the Nikonians Orange Directory, it is designed to help members and visitors of Nikonians find convenient listings of imaging and photography products and services. The focus of this service is business oriented, so used equipment sales and private ads are not eligible. Nikonians have access to used equipment postings in our "Want to Buy" and "Want to Sell" discussion areas located in the General Forums. The Nikonians Orange Directory has been added to the list of benefits for all Nikonians Platinum members, who will have free access to the directory for the duration of their Platinum level memberships. To be listed in the directory you will find an entry form, upload directions and payment options based on your choice of Business User Account levels. In preparation for the Holiday Season, our Business Directory staff has issued a 3-month free trial offer which expires on December 10, 2008. To take advantage of this offer, you must have a Business User Account. You can easily create your own account by registering for it online. In your email note make sure you include the email address you registered under, so that Hendric can activate your package. Don't forget that deadline is December 10. Nikonians Platinum members enjoy the benefit of no additional charge because their annual contributions cover the requirement for a Business User Account. Our Nikon D1/D2/D3 Users Group forums are buzzing with excitement over the prospect of a 24 Megapixel D3X. If you are in the market for this new flagship Nikon DSLR you need to stay tuned to our on-going conversations. More than 1,800 forum messages have been flagged by our NikoScope search engine in relation to the query: D3X. The first clues that something is in the works is the average selling price currently offered by the major online retailers. Many are dropping to an average $4,100 from the previous mark that was close to the Nikon MSRP of $4,999 (USD). We also take a bit of pride in knowing that our co-founders predicted this development over a year ago during a Bo & JRP chat News blog segment. 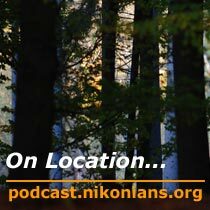 Nikonian Martin Joergensen's podcast video supplements are well known in the community. Since some time Martin also provides an automatically created photo gallery of all photographs from his podcasts, neatly ordered by podcast issue. Word has spread on our new "do it yourself" Nikonians Business card templates for Gold and Platinum Members. The new feature card was offered as a way of thanking our Gold and Platinum members for their support and to help spread thier pride in our community. The template can be found under "Your Personal Business Card" in the "User Menu" section. When you use the "Your Personal Business Card" option a card will automatically be generated for you, and you have 72 hours to download it in either a PDF or JPEG version. 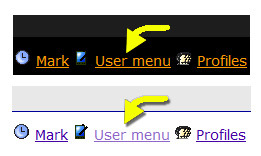 For a complete listing of services and features available at all supporting membership levels you can use the same "User Menu" page to compare the Silver, Gold and Platinum packages by clicking on the "Upgrade your membership" link. It will show your current level and provide you with your options. Nikon D3 and D300 owners need to make note of the caveats that they should have the latest firmware loaded on their camera bodies before using an SB-900 equipped with this version update. The Speedlight firmware is available for Mac and Windows (NikonUSA Support Site). Recent purchasers of Canon equipment may be waiting a while for their rebates. In posts made at popular camera forums, it appears the camera maker's supplier that processes the rebates has filed for Chapter 11 Bankruptcy. In contrast, NikonUSA supposedly processes their own rebates in-house but has received mixed reviews regarding turnaround times. See the official Canon statement here. Nikonians shooting RAW who want to test their workflow procedures and performance have a new - and free - online reference source available. The website, currently in the beta phase, makes it possible for you to assess the quality of your camera before the impact of any RAW conversion. By participating in the information exchange, you will be helping to form a reference database to share with fellow Nikonians. Check the Image Quality database for a look at how your participation will help this site become the "reference" benchmark for RAW information exchange. Nikon D90, can it really make a movie? Numerous happy D90 users report of its great performance, even above that of the D300. Knowing a little about the Nikon Engineering philosophy, this is not surprising. So what else can we ask from this camera? Well... can the D90 really make a movie? Martin has tried many of the more workflow-centric photo-editing programs, but always winds up doing most of his image work in good old Photoshop. This episode covers a few of his fairly primitive approaches to editing. Some specific examples of the edit-process. All shots are from the vampire session mentioned in the podcast. Thom weighs in on the long-awaited enthusiast replacement DSLR, the Nikon D90. While the still camera functions are a clear improvement over the few flaws of the D80, the HD video function is a long way from displacing current camcorder offerings. Nikonians member Daryl Godkin (dgwpg) from Canada is the Nikonians Photo Contest Winner for October with his image "The Blue Room"
As we approach the milestone 150,000 member mark, a new avatar feature has been added for our Silver, Gold and Platinum members. Images have to be smaller than 150Kb and will be resized to 96x96 pixels if larger. We suggest you upload jpg files, already sized to 96x96 at 72 or 96ppi so quality doesn't deteriorate or distort when resizing it if larger. Such a square 96x96 image, when compressed at 70% should not be larger than 10-15Kb, which would help for fast downloading of long threads. During the preparation of this avatar feature, Team Moderator Hal Becker (HBB) noticed his Microsft Windows platform was delivering "a string of MSN 'secure area' messages" every time he went from one window within Nikonians to another. He solved the problem by logging out of the Nikonians site, checking to make sure Nikonians.org is accepted for popups within MSN and logging back in again. He found that the secure area messages have disappeared. 1:20 Adobe Lightroom 2.0: Interview with Tom Hogarty of Adobe Systems. For the MP3 version of this podcast (audio only) click here (20MB). Phase One has arranged for a special 40% off for all visitors of Nikonians.org & Nikonians.de on purchases of Capture One 4 RAW workflow software. 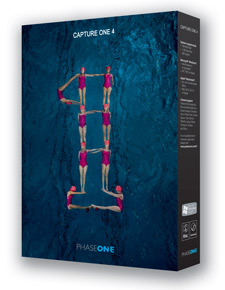 The Capture One 4 release less than a year ago created a stir in the imaging business, and Phase One has recently announced the release of Capture One 4 Pro (with a tremendous increase in features), but if you've been looking to expand your RAW workflow capabilities at a bargain price, this is a great introduction to the Capture One 4 experience. Capture One 4 brought us more consistent use of shortcuts, tools and naming. It is compatible with many other popular applications; for example, users can have a seamless workflow with Capture One to process RAW files and other post-production applications to post process images. --Manage and transfer license codes, so Capture One 4 can be used on one computer one day and on another computer the next. To take advantantage of the special Nikonians offer, all you have to do is enter the ordering site here. You will see your purchasing options in both USD and Euros, along with specific OS platform options. Once you make your choice you will hit a screen asking for your email address and password. IF you are a Phase One newsletter subscriber, that's what you enter. If you are not, -- go ahead and register for the newsletter, -- you're going to want it anyways to keep up with the newest Phase One news. Your 40% discount will automatically be applied. On Location's Martin Joergensen falls somewhere in the category "Is OK with images on a screen, but loves a great print". This week he takes his HP B8850 pigment based A3/13x19" printer through the paces and introduces you to his way of printing - unsophisticated but with great results. The slide show is now ready, showing some examples of the images that Martin selected to print and discussing briefly how to prepare them. Our Gold, Platinum, Team, and Moderator members are now able to access a new feature allowing you to create your own Nikonians business card. This new feature enables you to promote both yourself and the community. It's called "Your Personal Business Card" and can be found under your "User Menu." The business card includes the new motto and our co-founders have sent special notices to those members eligible for the business card feature to consider using it in their forum signature lines. Nikonians Academy Director Mike Hagen is in Tanzania, Africa, for a month-long Academy photo-safari, and before his departure he let us know the plans for traveling workshops in 2009 include some spectacular locations. We've been very busy creating new workshops for 2009 and are excited to announce many more travel and destination photography adventures. Our travel workshops have become an incredible success and we've already had a great year of traveling to Yosemite, Moab, Banff and Albuquerque for the big balloon festival. In fact, we have already left for our two photo safaris in Tanzania, Africa. The Nikonians Academy will be there for a month with 23 participants in two different groups. We are going to have a wonderful time photographing all the wildlife and scenery and will post our photographs upon our return in December. - Yosemite in Winter. February 19-22, 2009. - Bandelier National Park, Santa Fe, New Mexico. May 12-13, 2009. Beyond these fantastic travel workshops, we are still going strong with our "Master Series" of D300, Capure NX 2, Flash Photography and D90 workshops. These are extremely popular and continue to sell out in every city we run them. We should be in a city near you very soon. For more information, check our Nikonians Academy pages frequently. Apple's latest update to their Digital Camera Raw decoders now supports the latest Nikon models, including the D90 digital SLR and the Coolpix 6000 flagship compact. DCR 2.3 is available for Aperture 2 and iPhoto 2008. Mastering the Nikon D300 (Rocky Nook, $39.95 USD), by Nikonians author Darrell Young (DigitalDarrell) is now available. This book surpasses the basic user manual by providing step-by-step menu setting adjustments coupled with illustrations and logical explanations for each option. Mastering the Nikon D300 is the inaugural title kicking off the Nikonians Press imprint--the exciting, new joint venture between Nikonians and Rocky Nook. With his friendly and informative manner, Darrell makes the reader feel as if a friend dropped in to share his experience and knowledge while explaining the hows and whys in simple terminology. The learning experience for D300 beginners (and refresher information for professionals) goes beyond the camera itself, covering additional Nikon equipment, such as the use of optional Speedlights. Frequent references to the user manual provided by Nikon (with specific page references) allow the reader to easily navigate past the confusion that often comes with new equipment. It should be noted that the book includes a 50% discount voucher for a Nikonians Gold Membership. That is a $35.50 USD value. The Nikon Creative Lighting System: Using the SB-600, SB-800, SB-900, and R1C1 Flashes (Paperback) by Nikonians Academy Director Mike Hagen. He also mentions the fact that he brings his camera almost everywhere and that he gets some decent shots from those random non-shooting trips. During his going though old archives, On Location's Martin Joergensen dug out a bunch of old pictures shot on occasions where he wasn't really out shooting.